Heat olive oil over medium heat in large dutch oven. Stir in onion and a few pinches of salt and cook until softened and translucent, about 7-10 minutes. Add in minced garlic and saute with onion for about 1 minute. Then add in the red lentils and saute for 1 minute more. Pour in water or broth and the rest of the ingredients. Bring to a boil then reduce heat to a simmer. 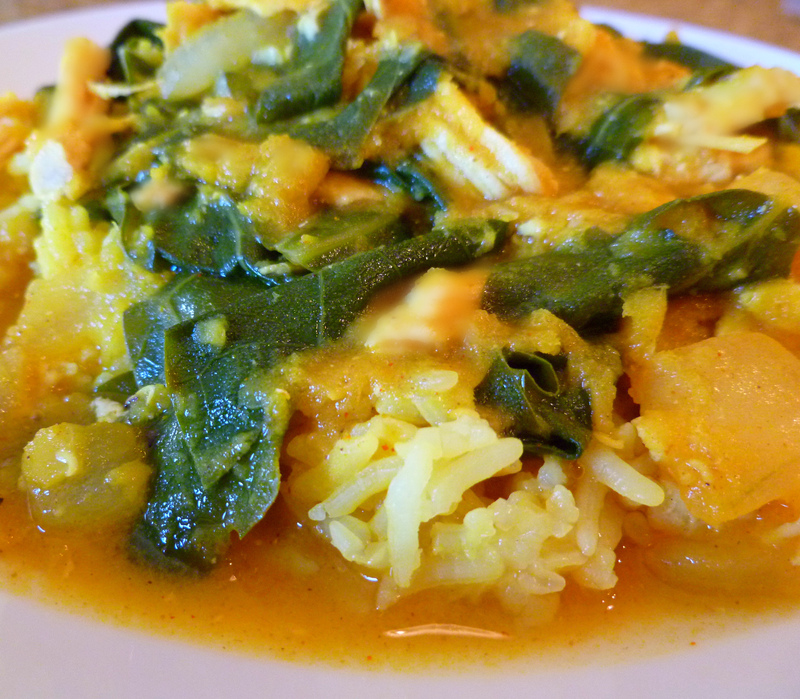 Simmer for 10-15 minutes or until greens are tender and the red lentils are partially disintegrated (see footnote!). Serve over jasmine or basmati rice. That’s it! Really. I told you it was uncomplicated! Red lentils cook REALLY fast. One minute they’re a lentil the next you can’t find them in the dish because they have disintegrated into a fine soupy base. I like to keep mine partially disintegrated. As soon as they start to break down, you must take it off the heat otherwise they will completely disintegrate as a base. Either way is fine but I like mine to still have some substance so it adds a little extra texture to this basic dish. If you are using collards, put them in according to the directions above. If you are using kale, you may want to wait to add it to the pot until there is only about 5-10 minutes left as it does not take as long to soften up. If you use spinach, add it just a few minutes before it it completed. This is a saucy dish so be sure to make rice to accompany it. Put a nice helping of rice in the middle of the plate or a big bowl and spread around to look like a pancake. Add the Masoor Dhal on top and serve! I love lentil dishes, especially when they’re spicy and its chilliy outside! I’m going to have to make lentils for dinner tonight now, thanks for the inspiration and I hope you enjoy the pancakes! !